The movie begins with Dwayne Johnson’s Mitch Buchannon, head lifeguard of Baywatch, running around his beach, reaffirming his supremacy. Tryouts for positions on his team are tomorrow, and today a few of the new recruits introduce themselves. One is Ronnie (Jon Bass), the tubby, nerdy tech guy with a thing for always- running-in- slo-mo Baywatch hottie CJ (Kelly Rohrbach). Another candidate is Alexandra Daddario’s Summer, who will be the slo-mo brunette to CJ’s blonde. (Ilfenesh Hadera is Stephanie, the most authoritative female of the crew.) The guy who headquarters says must be included is disgraced Olympic swimmer Matt Brody (Zac Efron), who’s getting on the crew in a combination of publicity stunt and community service. Mitch is not too happy about this. His name-calling of Matt (which does include the sobriquet “High School Musical”) is one of the few running bits that manage to raise a smile. After all the characters are introduced, we cut to the next day’s tryouts, at which Ronnie and Summer prove their mettle, and Mitch goes head-to- head with Matt who thinks the rules don’t apply to him. While Buchannon and Brody are chastising each other, businesswoman Victoria Leeds (Priyanka Chopra) has been buying up much of the property along the bay to lock down her drug distribution ring by offering the owners large sums of cash or by threatening their lives. This is a job for Baywatch. The film turns around the budding bromance between Mitch and Brody that certainly feels the realest of the plot. The movie features long periods of too-sincere homilies about teamwork and weirdly gratuitous brutality. On the plus side, it has a pervading air of crass amiability about it—it’s almost like a two- hour end-credits gag reel — nevertheless, it contains an end credits gag reel. 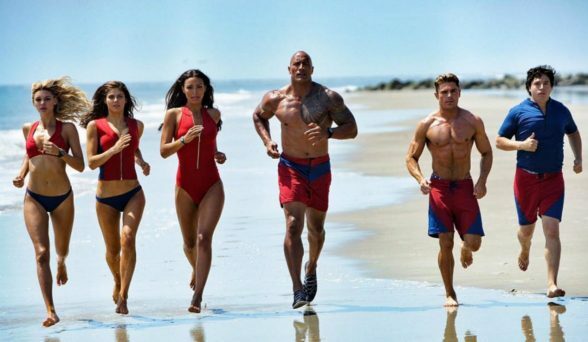 Baywatch brings many of the signature elements of the show to the big screen with mixed results and nothing screams summer movie season more than a movie about beautiful people by the water engaging in action stunts, but this picture just misses the mark in so many ways that it is hard to recommend it. If you saw the trailer, you got the best the movie has to offer.